When it comes to caring for your dog, selecting the type of food you are going to feed him seems like it would be an easy task; but in reality, it’s a lot more involved than it might first appear to be. There are so many different dog food brands on the market, which can make it difficult to decide which option to choose. Of course, you want to select a food that will provide your pup with the nutrition that he needs to thrive. However (and unfortunately), while there are so many different dog food choices, not all of them are created equally. In fact, many formulas are made with subpar ingredients, such as fillers, dyes, additives, and preservatives that can actually do more harm to your furry friend than good. That’s why it’s imperative to select a food option that is made by a reputable manufacturer and features premium quality ingredients, and Hill’s Science is one of those options. Known for creating a variety of food choices that are specially formulate to meet the unique needs of dogs of all types, ages, and activity levels, such as grain free dog food, senior dog food, dog food for weight loss, there’s a Hill’s Science Diet dog food available that will provide your pup with the best possible nutrition. Furthermore, all of their formulas are made with the highest quality ingredients to provide pups with well-balanced meals that are good for them – and tasty, too! But with so many different types of Hill’s Science Diet dog foods on the market, trying to narrow down the options can seem daunting. To help you find the best Science Diet dog food, we’ve enlisted the help of veterinarians and animal nutritionists. We’ve also read through countless Hill’s dog food reviews to see what customers had to say. Our research has allowed us to narrow down the field to what we consider the top five Hill’s Science Diet dog food options. Why Consider Feeding Your Dog Hill’s Science Diet? Now that you’ve seen our top five Hill’s Science dog food choices, let’s take a closer look at each one. Below, we offer an in-depth review of each formula, including the ingredients they contain, what we like about them, and what pet parents have had to say. Once you have read through the reviews and selected the option that you think will best meet your furry friend’s nutritional needs, click on the buttons to find the best prices available on Chewy and Amazon. If you have a large breed adult dog, such as a Great Dane, a Mastiff, a Rhodesian Ridgeback, or a Saint Bernard, you are going to want to feed him a high quality food for large dogs that is specially formulated to meet the needs of adult dogs. Based on the Hill’s Science Diet reviews that we read, their Adult Large Breed Dog Food is one of the best quality dry dog food options for adult large breed dogs. What makes this option such a good choice for large dogs is that it contains natural glucosamine and chondroitin, two ingredients that help to support joint health. Large breeds, in particular, are prone to joint issues, such as hip and elbow dysplasia, so by offering your pooch this formula, you can help to ensure that his joints maintain their strength and potentially offset problems. The inclusion of glucosamine and chnodroitin isn’t the only reason why this dog food is so high quality. It also contains reach animal protein, which is derived from chicken, as the first ingredient. It also features cracked pearled barley, apples, carrots, broccoli, cranberries, and green peaas. Infused with essential vitamins and minerals, such as vitamin A, vitamin C, vitamin B12, zinc, taurine, and calcium, this Science Diet dog food packs in all of the nutrition that your four-legged family member needs to thrive. Glucosamine and chondroitin support joint health. Final verdict: With Hill’s Science Diet Adult Large Breed Dog Food, you can ensure that the unique nutritional needs of your large pup will be met. Our experts were impressed by the high quality ingredients, and the majority of customers were, too. 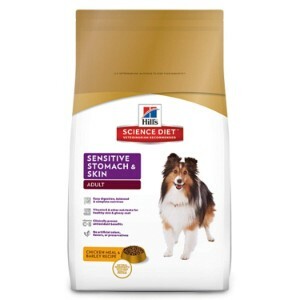 For pups that have a sensitive tummies and/or skin, Hill’s Science Diet Adult Sensitive Stomach and Skin Dog Food is an excellent option. It’s a dog food for sensitive stomachs and a dog food for allergies all in one! That’s because it is formulated with proteins and carbohydrates that are easy to digest, therefore easing any tummy problems. It also contains fewer proteins than other types of dog foods, which reduced the chances of any allergy flare-ups. Brewer’s rice is the first ingredient in this dog food, which is easy to digest and helps to prevent allergic reactions. It does contain chicken, however, which many dogs are allergic to. But, since chicken is the second ingredient, there is less of a chance that a reaction will occur. This food also contains a variety of essential nutrients, including omega 6 fatty acids, amino acids, calcium, antioxidants, vitamins A, B, C, and E, just to name a few. Most pet owners say that their dogs love the flavor and that they have noticed a definite difference in their digestion and/or skin. Final Verdict: Overall, we were very impressed with Hill’s Science Diet Adult Sensitive Stomach and Skin Dog Food. Based on the Hill’s Science Diet dog food reviews, most customers who have used this product have experienced positive results; however, it does contain chicken, so if that’s an allergen for your dog, you might want to consider another option. Just like humans, it’s important for dogs to maintain a healthy weight. If your dog is carrying around extra pounds, it can cause a number of health complications, such as joint issues and cardiovascular disease; just to name a few. Whether you have a Pug, a German Shepherd, a West Highland White Terrier, a Schnauzer, or any other breed, if your four-legged friend is overweight, you should consider feeding him Hill’s Science Diet Perfect Weight Adult Dog Food. This formula features a reduced calorie content, which translates to weight loss. In fact, more than 70 percent of the overweight dogs who are fed this weight loss formula from Hill’s Science Diet lose weight in just 10 weeks! Not only does this formula support weight loss, but it also helps to maintain lean muscle mass. Real chicken is the first ingredient, which means that your pooch will be getting the protein that he needs to sustain healthy joints. It’s also easy on the stomach, thanks to the prebiotic fibers that it contains, which are easy to digest. And, of course, as with all Science Diet formulas, it contains a wealth of nutrients, and is completely free of artificial colors, flavors, and preservatives. Most pet owners said that they saw a definite difference in the weight of their switched to this formula from Hill’s. 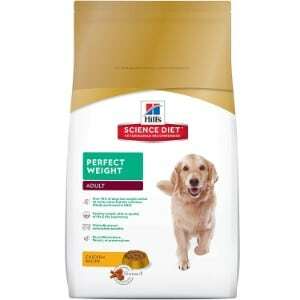 Final Verdict: If your pup is putting on weight because of limited mobility, age, or for any other reason, consider feeding him Hill’s Science Diet Perfect Weight Adult Dog Food. This dog food is formulated to help aid in weight loss while still providing the balanced nutrition that your pup needs. While some users said that they didn’t see any results, that’s likely because they were overfeeding their dogs. In our opinion – and the opinion of many pet owners – this formula does aid in weight loss. If your dog is finicky and just won’t eat dry food, or he has dental health issues and dry food is difficult for him to eat, than a premium quality wet dog food is a great option to consider – like Hill’s Science Diet Wet Dog Food. Featuring meaty, yet tender morsels that are easy to chew and digest, and offering savory chicken and stew flavor, your pooch will find this dog food very palatable; and you’ll be happy to know that he’s getting the nutrition that he needs. Made with premiums cuts of lean protein, including chicken and beef, this wet dog food from Hill’s Science Diet will help to build lean muscle and support your pup’s joints. It also features a variety of garden vegetables, including potatoes, spinach, and beets, as well as a variety of vitamins and nutrients, this food offers balanced nutrition to maintain your four-legged family members overall health. All of the ingredients are combined in delicious sauces and slowly stewed to create a succulent flavor that will please any pup’s palate. It’s suitable for all life stages and sizes, making it an ideal food for small dogs or a dog food for labs and other large breeds, too. All that this wet dog food lacks is artificial flavors and preservatives! Most pet owners report that their furry friends love the taste; even those who are extremely picky. Final Verdict: If you are looking for a highly quality wet dog food that is easy to digest, easy to chew, and tastes great, then Hill’s Science Diet Wet Dog Food is an excellent option to consider. It offers balanced nutrition, like all Hill’s products, features premium quality ingredients, and most pet owners say that their dogs’ love the taste. For large breed dogs that are having mobility issues as a result of joint health problems, Hill’s Science Diet Healthy Mobility Dry Dog Food for Joint Health is a great choice. This formula is specifically designed to improve the health of your pup’s joints and improve his mobility. In fact, Hill’s claims that it can improve mobility within just 30 days! This dog food contains a variety of ingredients that are meant to strengthen the joints, such as real animal protein and fish oil derived omega 3 fatty acids. It also contains glucosamine and chondroitin, which help to improve the health of a dog’s joints and cartilage. Antioxidants support a healthy immune system, and the inclusion of a variety of essential vitamins, minerals, and amino acids will improve your pup’s overall health. Like all other Hill’s Science Diet formulas, their Healthy Mobility formula is completely free of artificial colors and artificial flavors, as well as preservatives. 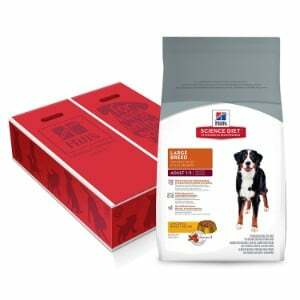 Final Verdict: If your pup is experiencing issues with his mobility as a result of joint health problems, consider feeding him Hill’s Science Diet Healthy Mobility Dry Dog Food for Joint Health. It is specifically made to improve the health of the joints and improve mobility. Most pet owners say that their dogs love the taste, too. Making sure that your dog received the very best of care is your top priority; after all, he’s more than just a pet – he’s a member of your family! That’s why you go to great lengths to ensure that you are offering him the best products that are designed to improve his health, keep him safe, and just make his life as enjoyable and comfortable as possible. For instance, you likely have the most comfortable dog collar and dog harness for him so that he can enjoy his walks. You likely have the most secure dog crate, the most comfortable and supportive dog bed, a dog house that features all the bells and whistles, an outdoor dog kennel where he can enjoy being outside in safety when you can’t take him for a walk, and maybe even a dog playpen where he can be kept safe when keeping all eyes on him isn’t possible. But of all the products that are available for your dog, there’s one product that’s more important than all the rest: his dog food. It’s absolutely essential that you feed your pup the best possible dog food that will meet all of his nutritional needs. 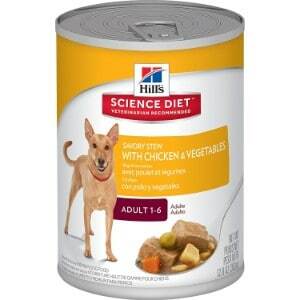 While there are tons of dog food options available, one of the best is Hill’s Science Diet. To find out why you should consider filling your pet’s dog bowl with Hill’s Science Diet dog food, read on to find out more about this company and why it’s one of the most trusted pet food manufacturers. Hill’s Science Diet has been around since the 1960s; that’s a long time for a pet food company! The company was started by Dr Mark L Morris, a veterinarian who as tasked with the job of creating a specially formulated dog food for a German Shepherd that was suffering from kidney disease. After successfully making the dog food that he was asked to, the door for creating specialized dog food formulas was opened, and hence, Hill’s Science Diet was born! The dog foods that are offered under the Hill’s name are created by specialists in animal nutrition and veterinarians, and the goal of the company is to offer pet parents premium quality food choices that will meet the unique nutritional needs of their pets. For almost 60 years, Hill’s Science Diet has been able to provide the best possible foods that pet parents can trust for their four-legged family members. Natural vitamin and mineral supplements, including glucosamine, omega 3 and 6 fatty acids, amino acids, B vitamins, vitamin A, vitamin E, and so much more! In other words, if you want to ensure that your pet is receiving the very best nutrition possible, then Hill’s is definitely an option that you are going to want to consider. And, because all of their formulas are designed to provide specific benefits for particular needs, such as mobility issues and weight control, you can rest assure that your four-legged family member will be receiving the essential nutrients that he needs to thrive. When it comes to dog food brands, there are tons of options to choose from. 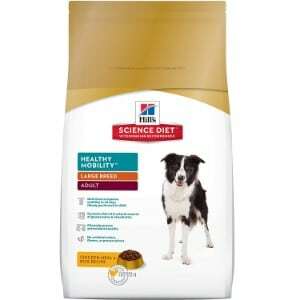 But if you’re looking for something that you can rely on to offer high quality ingredients that your pet really needs to be as healthy as possible, then you should really consider Hill’s Science Diet. While the five options we listed in our review are what we believe to be the best choices from Hill’s, all of their dog food formulas feature the very best ingredients and are specifically made to enhance the health and well being of all pets. For the best nutrition possible for your four-legged family member, Hill’s Science Diet will be sure to satisfy both you and your pooch. Although not mentioned, the formula for Hill’s Science Weight Reduction r/d canned dog food was changed in June 2018 increasing the Kcals per can from 257 to 299 (per my communication with Hill’s). However, Hills has yet to change this information on their website to reflect the Kcal increase.